The Morane-Saulnier Alcyon (en: Kingfisher) is a two or three-seat basic training monoplane designed and built in France by Morane-Saulnier. 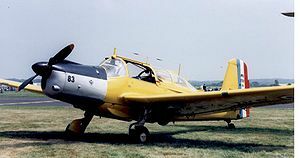 Designed as a basic trainer for the French military the prototype MS.730 first flew on the 11 August 1949. The protoype was a low-wing cantilever monoplane with a fixed tailwheel landing gear and powered by a 240hp (134kW) Mathis 8G.20 inverted V8 engine. The engine was replaced with a 240hp (179kW) Argus As 10 and the prototype flew again in November 1949 as the MS.731. Two further prototypes were built and flown in 1951 designated MS.732, they were each powered by a Potez 6D.30 engine and the original fixed landing gear of the prototype was replaced with retractable main wheels. Picture - Preserved MS.733 with French Navy markings on display in France, 2009. The production version followed designated the MS.733, with five pre-production aircraft and 200 production aircraft. The aircraft were delivered to the French Navy (40), the French Air Force (145) and the Cambodian Air Force (15). Seventy of the French Air Force aircraft were fitted with machine-guns for gunnery training and some of these were later converted for counter-insurgency operations (and re-designated MS.733A) for use in Algeria. After the war, some aircraft were sold to Morocco. The Alcyon was a successful trainer, capable of basic aerobatic maneuvers. It was often used in replacement of pre-war vintage Stampe SV.4 biplanes. Several civilian flying schools, including Air France, used the Alcyon. For the time, it was well equipped with full IFR equipment: two VOR-ILS sets, one ADF set, two VHF radios, an attitude indicator and a directional gyroscope. For this reason, it was often used for navigation training as it was far cheaper to operate than the twin-engine designs commonly used for that task. Since retirement by the French military services, several Alcyons have been restored to flying condition by private owners and groups. Prototype powered by a 240hp (134kW) Mathis 8G.20 engine, one built later re-engined as the MS.731. Prototype re-engined with a 240hp (179kW) Argus As 10 engine. Prototypes powered by a 240hp (179kW) Potez 6D.30 engine and retractable landing gear, two built. Production variant with a 240hp (179kW) Potez 6D.30 engine, five pre-production and 200 production aircraft built. MS.733 gunnery trainers modified for counter-insurgency role. Morane-Saulnier Alcyon Pictures and Morane-Saulnier Alcyon for Sale.